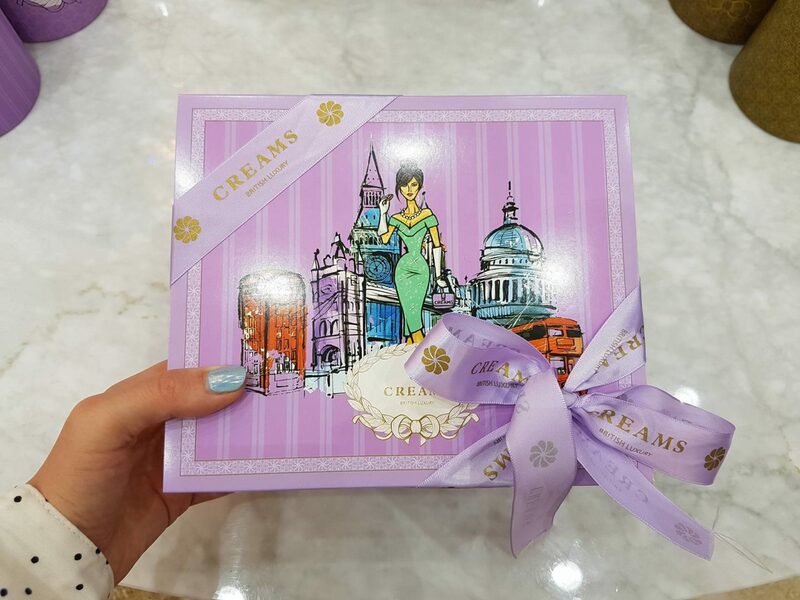 I can’t lie; when I found out about Creams British Luxury opening at Bluewater, I was excited. 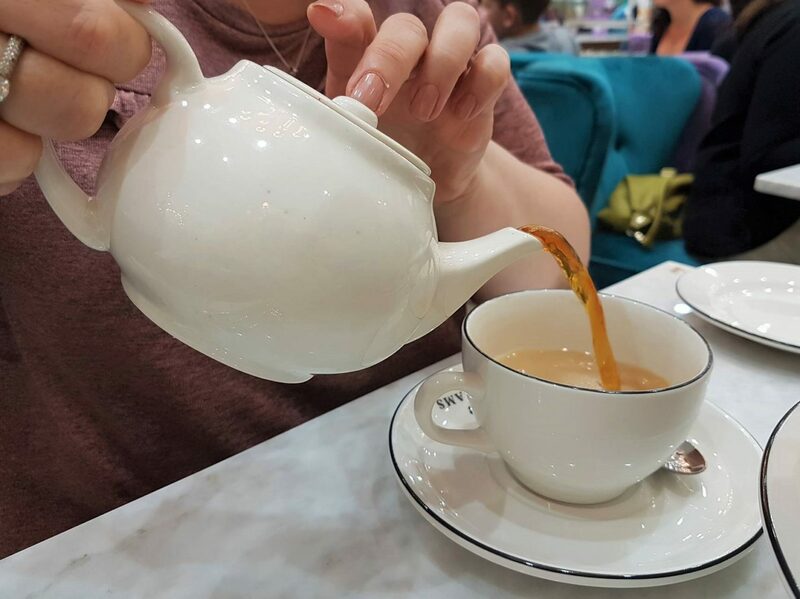 As far as I’m aware, there’s nowhere else at Bluewater that you can go for an afternoon tea. I was delighted to be given the opportunity to visit them and write a review. My mum adores afternoon tea, so I thought I’d take her as my guest for a pre-birthday treat. When we arrived at Bluewater, it was incredibly busy. Creams British Luxury was also full to the brim, with a small queue forming outside the door. The smartly dressed lady at the door asked us if we’d be able to return about 20 minutes later. I explained that we had a booking for 2pm. Looking around, we could both see that there were no tables available. At that point, the manager came over to see what was happening and we told her that we’d had a table booked. Opening her book to take down her phone number, (to call us when a table was free), I saw that our booking had been scribbled out! When I pointed it out, she was very apologetic, asking me to wait for a moment and see what she could do, but I told her we’d return. We started to do some shopping, but when we passed by 20 minutes and 40 minutes later, every seat was still taken. However, when we eventually returned again around 3pm, there was finally somewhere for us to sit. As we finally sat comfortably on our plush teal and purple seats, we opened our menus. What a joy to behold! 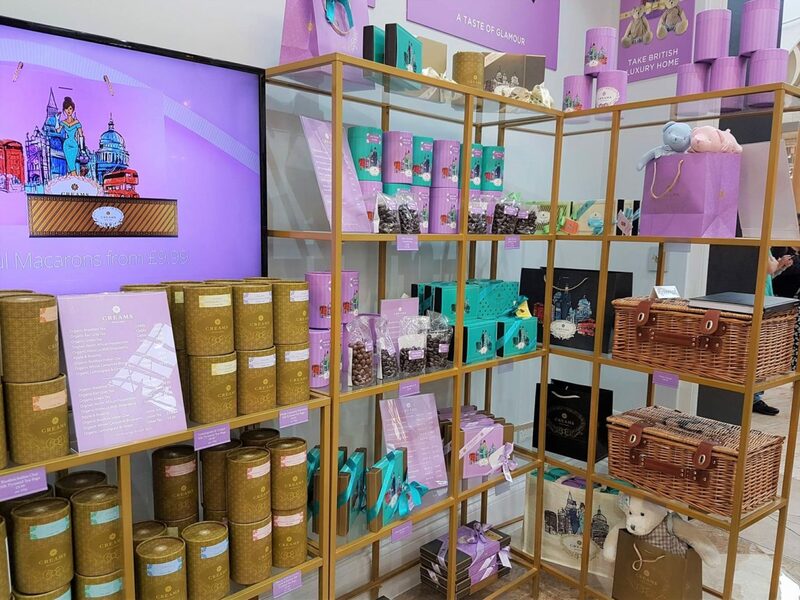 Creams British Luxury is a sweet tooth’s dream. Although there are wonderful breakfast and lunch foods on offer, as you’d imagine it is mostly desserts and lots of them. 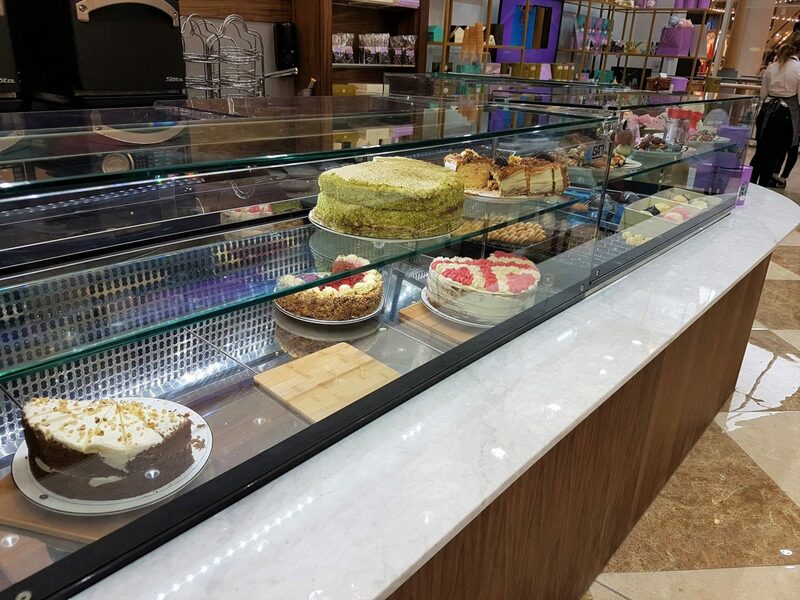 As well as afternoon teas, they offer all kinds of cakes, cheesecakes, gelato, chocolates, macarons, sundaes, waffles and milkshakes. There are five types of afternoon tea available. My mum and I decided to go for the CREAMS British Afternoon Tea. 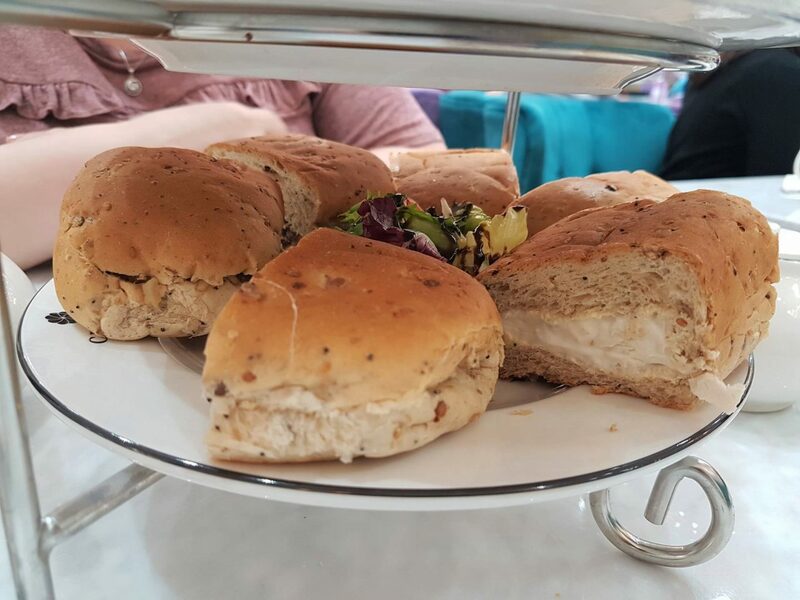 Served with a pot of English breakfast blend, it comprises of mini brioche buns filled with chicken mayonnaise, cheese & spring onion and egg mayo. 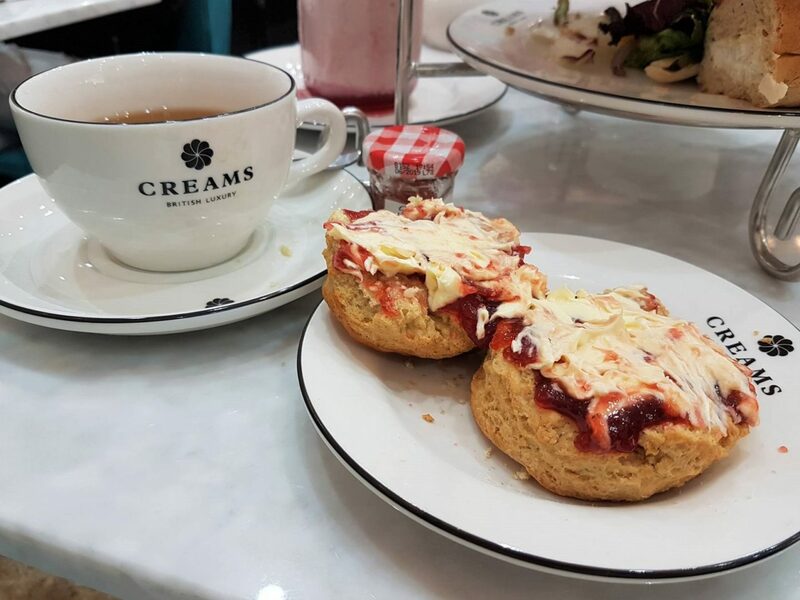 It is accompanied by a sultana scone with strawberry preserve and clotted cream, as well as a selection of cakes and patisserie. Fortunately, we didn’t have to wait long for it to appear, which was very welcome as we were rather hungry! Unfortunately, my mum’s teacup had a mark or stain on it. 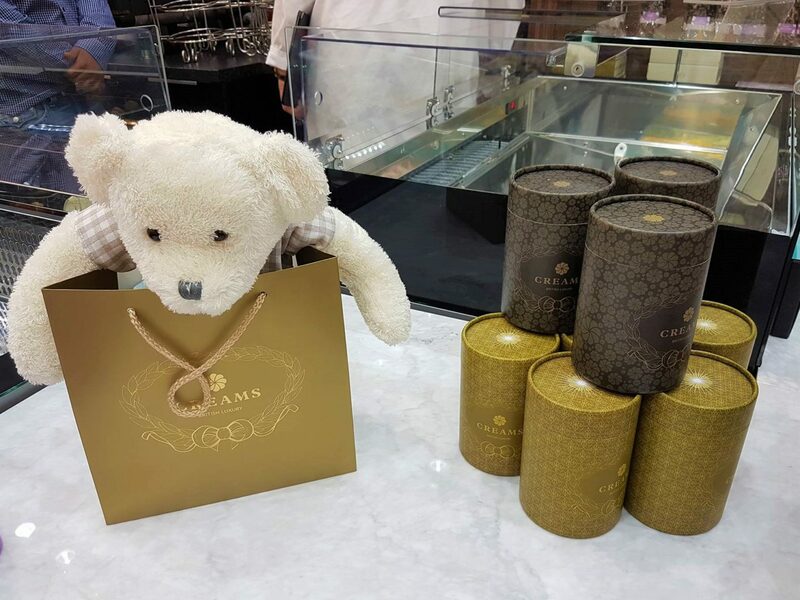 We were a little surprised, as we thought Creams British Luxury was quite upmarket and would take care to make sure that everything looked just so. 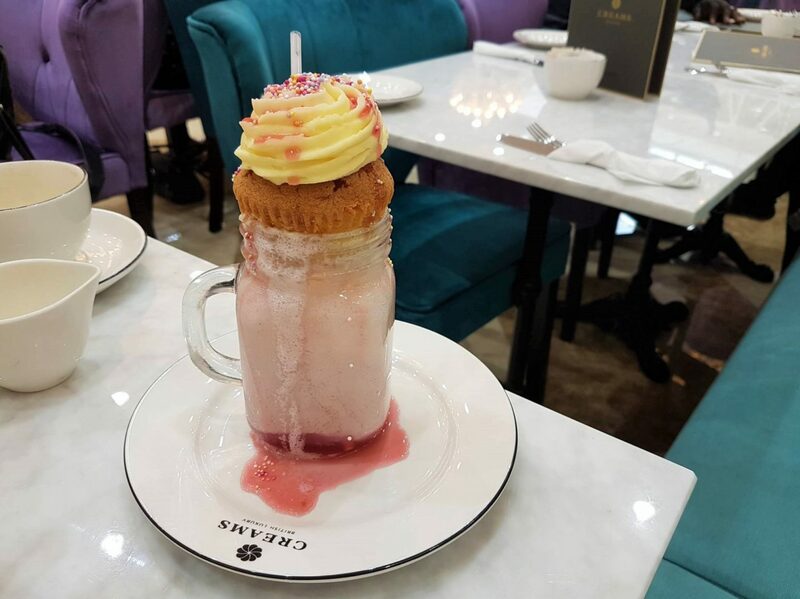 As well as unusual flavours of milkshakes, Creams British Luxury do ‘freakshakes’. Described as ‘a monstrous mashup of a drink and dessert’, these seems to be one of their main pulls. Freakshakes come in three favours (Chocolate Monster Freak, Strawberry Freak and Tough Cookie Freak). Unfortunately, milkshakes often don’t agree with me, so I had to get my mum to put them to the test! She decided to go for the Strawberry freak, which is vanilla ice cream, strawberry sauce, 100s & 1000’s, strawberry cupcake and macaron with popping candy. They’d run out of strawberry cupcakes (and possibly strawberry macarons) as my mum’s was topped with a vanilla cupcake. When it arrived, she just looked from the afternoon tea to the freakshake and back again several times, unsure how she was going to manage it all. The afternoon tea was three tiers of deliciousness. On the top tier, we had a large cupcake, two raspberry chocolates, four pieces of strawberry, two macarons and two mini puddings (bread pudding and a black forest cake). The middle tier had two scones, two pots of cream and two small jars of Bonne Maman strawberry preserve. The scones were notably missing the sultanas that the menu said they’d have, but I didn’t mind as I prefer plain scones anyway. The bottom tier had the brioches with tasty fillings in. The raspberry chocolates were absolutely delicious and the pieces of strawberry provided some welcome freshness from everything else on the stand. Believe it or not, neither my mum or I had tried macarons before. However, we both thought they were tasty and probably just as macarons should be. They were quite crisp and crunchy on the outside and soft in the middle. I had the lemon flavoured one and found it beautifully zingy. My mum enjoyed the mini bread and butter pudding, and we shared the mini black forest cake. The filling was gorgeous and the cake was ever so soft and spongey. There was also a large cupcake on top! The cupcakes have lovely buttercream. I thought the scones were lovely and my mum agreed, but thought they were a little on the dry side. 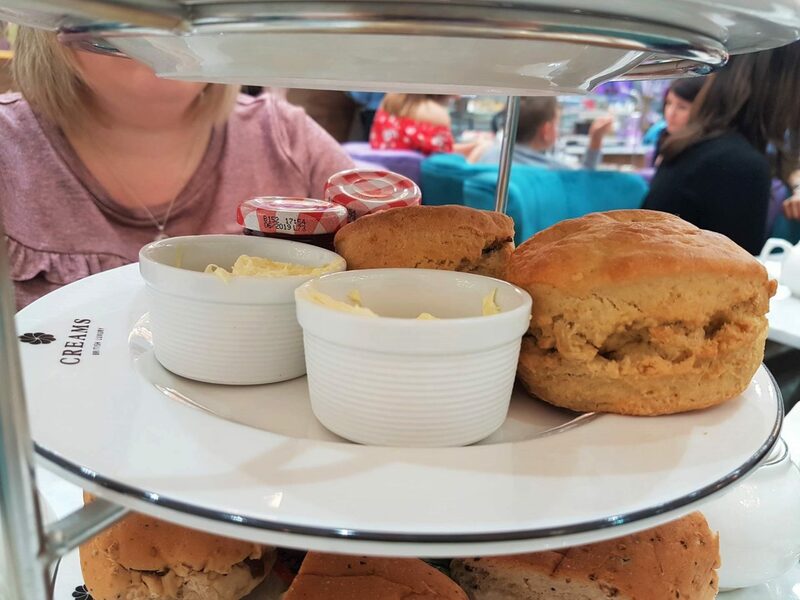 However, my mum is something of a scone connoisseur as she holidays in Cornwall most years and enjoys a cream tea while she’s there. Speaking of which, the Cornish way to make a cream tea is JAM FIRST, so that’s how I make my cream tea in case anyone wondered! I love Bonne Maman jam, so I found the cream tea tier absolutely delicious. I couldn’t fault it at all. The brioches were seeded and the fillings were very tasty. They were very generously filled, so they make you feel full very quickly. As such, we were a bit naughty and skipped most of them so that we could get onto the sweet things! 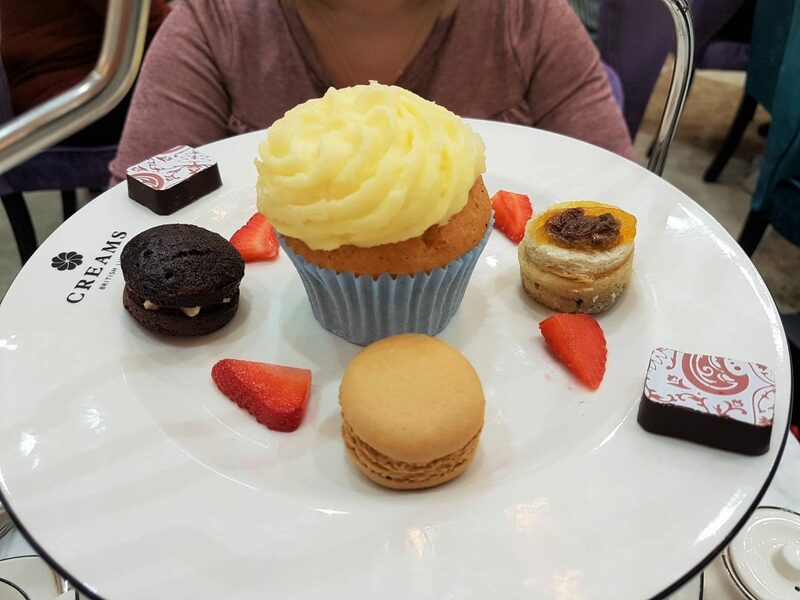 I think we could have done with a third person helping us to eat our afternoon tea, really! When we’d eaten as much as we could, I looked across at my mum who was feeling guilty about not finishing everything, particularly as she hadn’t had much of her freakshake. 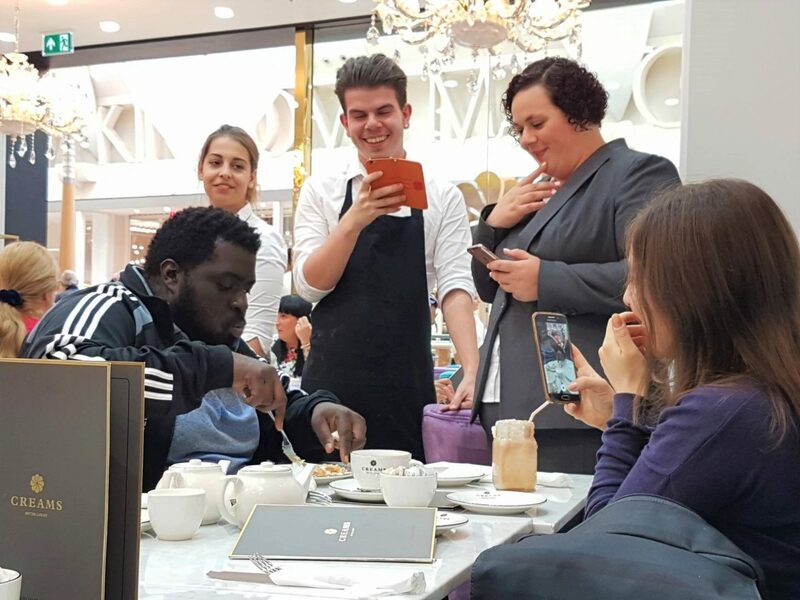 Then, we noticed at the table next to us, staff were standing with their phones out next to a man. It turned out that he was attempting to drink/eat a freakshake in 2 minutes and they were timing him. It was quite amazing to watch; he did so well! He managed it and got an afternoon tea for 2 as a result. About 30 seconds later, my mum started to drink her freakshake. “I thought you were full…did the man over there inspire you?” I asked, grinning. “Yeah, I think so”, she laughed. 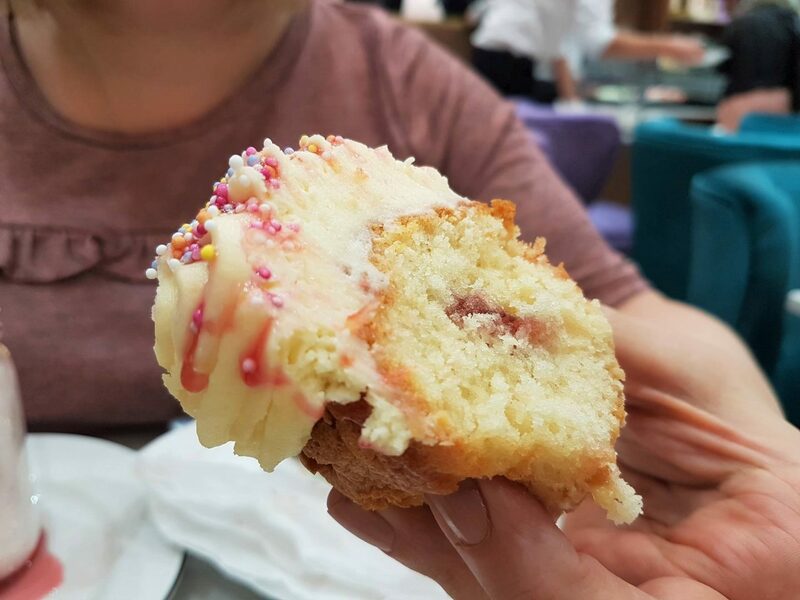 When she bit into her vanilla cupcake, it turned out that it had a filling which was a pleasant surprise! When we’d finished eating, we wandered over to the gifts area. 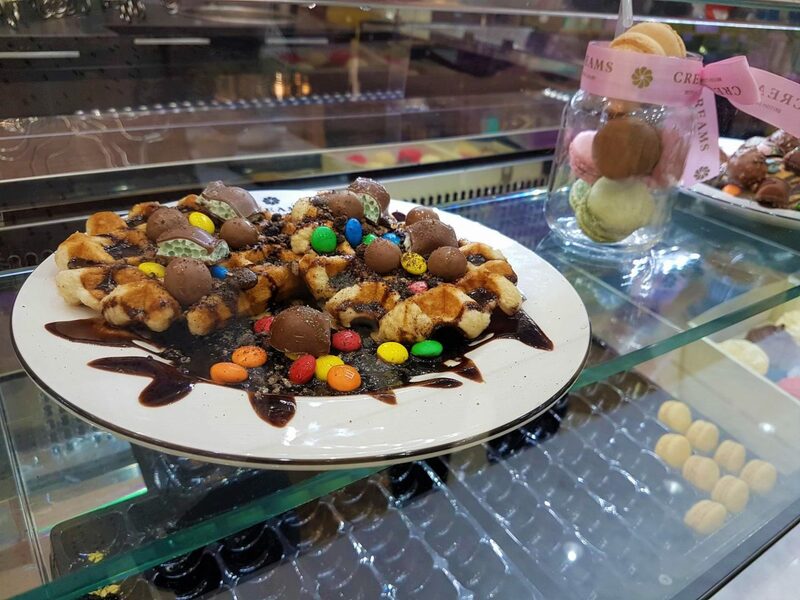 On the way, we stopped by the cabinet at the front to look at the deliciously tempting cakes and waffles. The gifts area is beautifully laid out. As with the colours elsewhere, the colours and designs of the packaging all compliment each other. 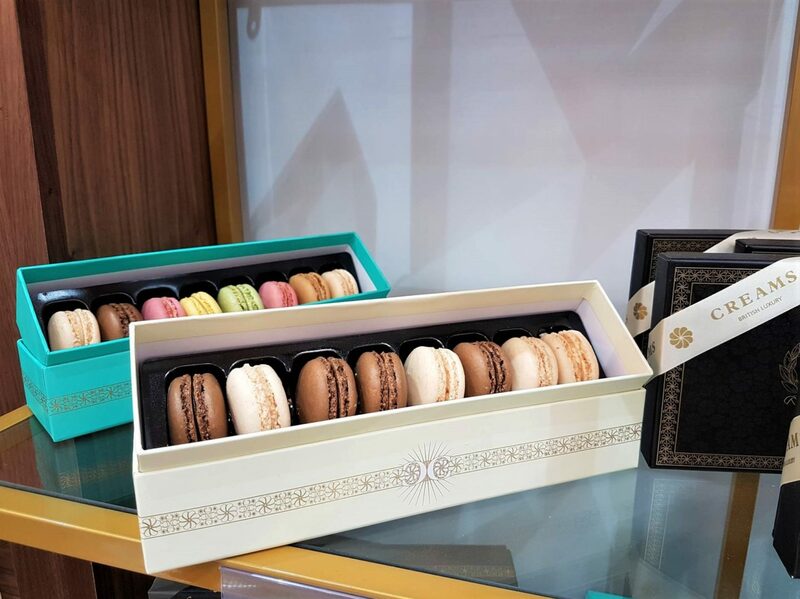 As well as macaroons, chocolates, tea and more, you can also purchase gift vouchers. 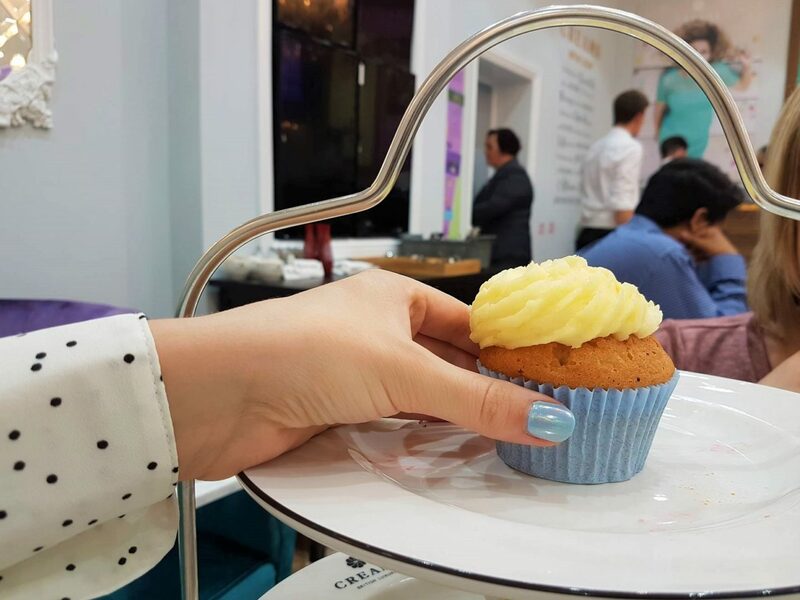 Although there were a few issues, it had been less than a fortnight since Creams British Luxury opened at Bluewater when we visited on Thursday 10th August. I’d like to give them the benefit of the doubt and assume that the problems were teething issues. Perhaps they didn’t realise quite how popular they’d be initially and our booking was crossed out in a stressful moment, mistakes happen. The staff were all lovely and friendly, and very apologetic. It is a lovely environment to enjoy an afternoon tea in and we did enjoy the experience. I look forward to returning sometime to try out their other desserts (also, I’m pretty sure my husband could demolish the freakshake in 2 minutes)! Disclosure: I received an afternoon tea for two and a freakshake in return for a review. As always, all views and opinions are honest and my own. 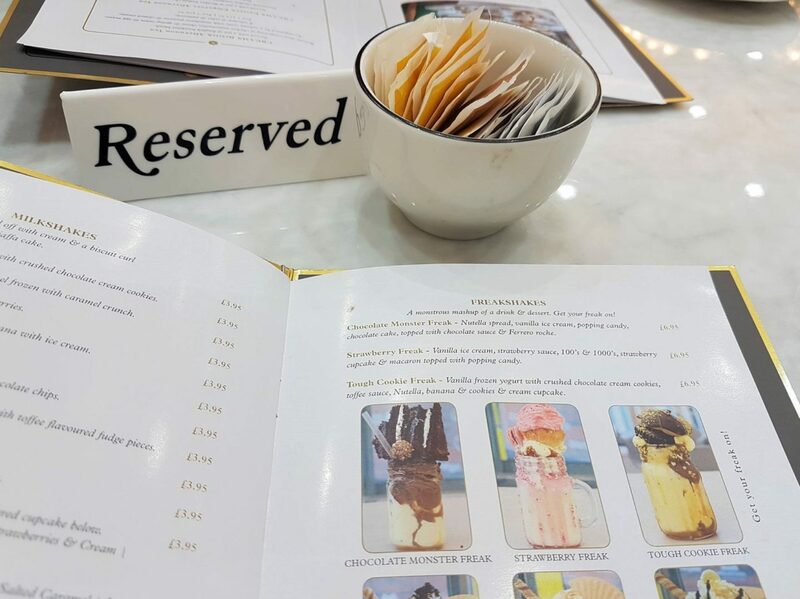 06/01/2018 Update: We were invited back to try Creams out again once the aforementioned issues had been resolved. This was cancelled due to other issues documented in the local news. I politely declined to return and received a somewhat rude response. Since then I have received no further contact. 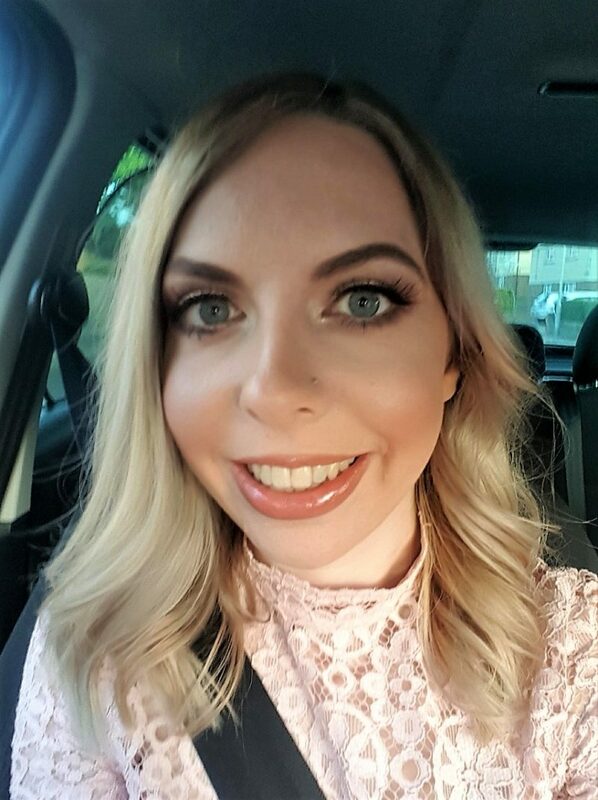 AutumnsMummy, since your review we’ve been to Creams and like quite a few others had a bad experience, and felt sorry for the young staff there – I’ve since heard that these young people haven’t been paid for weeks and their parents have had to go to the shop to ask for their wages. Everyone was looking forward to this opening at Bluewater but its a franchise that appears to be badly run. My daughter doesn’t work there, but as a mum I can imagine how upset I’d be and maybe you can too. 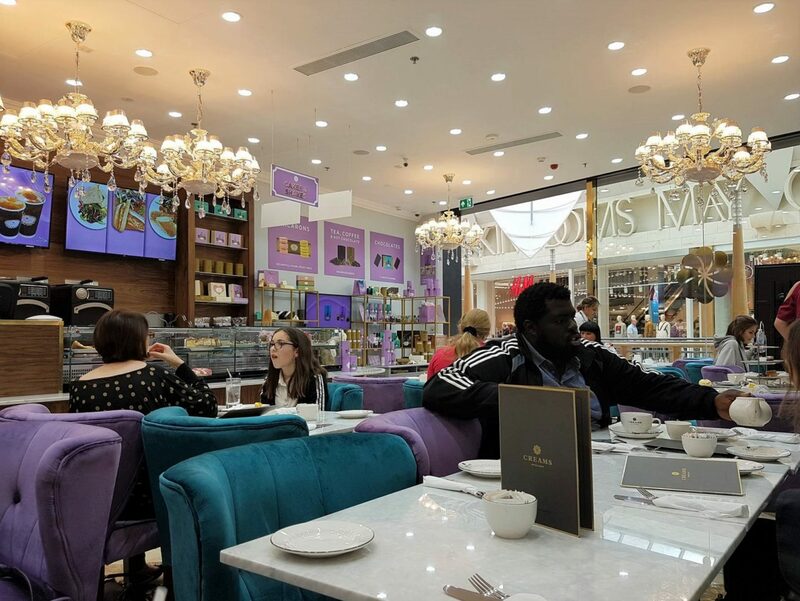 If you’re local enough to Bluewater maybe you’d like to invite others to chip in with their experiences, and if they don’t live up to yours, we could get the Bluewater management team on to it? Hi Mandi, thanks for commenting. I have heard from people locally that all but one member of staff haven’t been paid for 6 weeks (which I believe was when it opened). When I walked past last week, it was virtually empty and I think only half the workforce had turned up (quite understandably). As you’ve said, there was a lot of hype and excitement around its opening which unfortunately it just doesn’t seemed to have lived up to so far. It’s a real shame, as the concept is lovely and it has real potential. 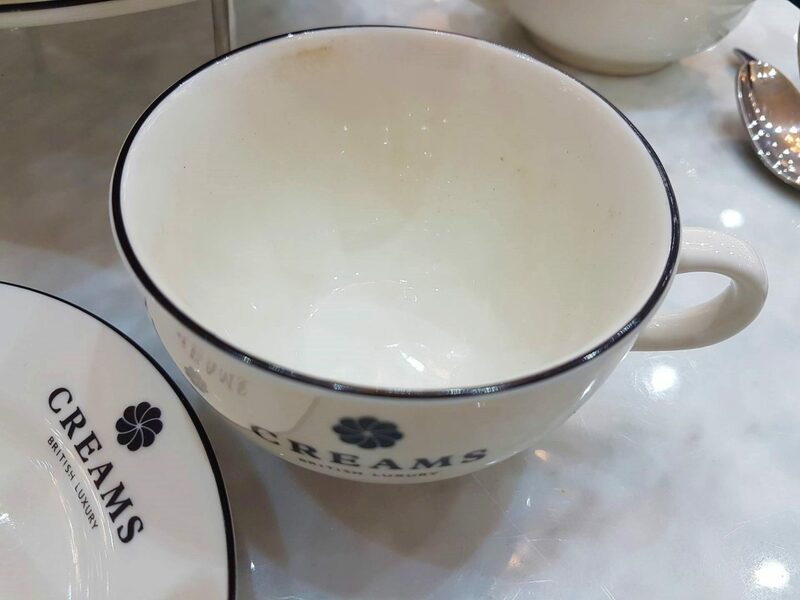 Creams British Luxury have read this review and were saddened to hear of my experience. Someone from head office was sent down to rectify these problems and I was actually due to revisit tomorrow in order to see the changes and write another review. Of course, with the current issues I have now been asked not to come tomorrow. To be perfectly honest, if staff aren’t getting paid to serve me, I don’t feel comfortable with visiting anyway until the problem has been resolved.